Baby teeth are also known as primary teeth and begin to show around six months of age. If you’re a parent, you’ve been through it before. When your child starts teething around six months of age, you know that it means sleepless nights, louder cries and lots of drool. But why exactly do we go through two sets of teeth in our lifetime? Our other bones grow as we do—why don’t our teeth, too? The reason is simple. Our jaws aren’t big enough to hold a full set of adult teeth at birth. Think of baby teeth, also called primary teeth, as placeholders. These 20 small teeth reserve the needed space for adult teeth and help to shape the jaw. When adult teeth begin to break through the gums, the process is known as eruption. Fun Fact: The most important baby teeth are molars, which are actually much broader than the permanent teeth that grow to take their spot! Sometimes baby teeth fall out too early or have to be removed due to cavities or other oral issues. When this happens, it’s common to lose some of the space reserved for adult teeth. This can lead to a very crowded mouth and the need for braces. 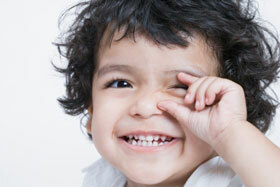 In some cases, losing baby teeth too soon can even slow the growth of the adult tooth beneath it. To give your child the best shot at a healthy mouth and straight teeth, it’s important to practice good oral hygiene even before teething starts. Remember to wipe down your babies gums after feedings. When teething begins, brushing gently twice each day with a soft bristled brush is recommended. « What’s That Pendulum in My Mouth?